Manafort Plea Deal Raises Key Question: What Does he Know? Trump’s former campaign chairman, who for months stood resolute in his innocence, reached an extraordinary plea agreement with special counsel Robert Mueller’s office. The question remains what information Manafort, 69, is able to provide about the president. As Trump associates folded one by one over the last year under the pressure of federal investigators, there was always Paul Manafort. Donald Trump’s former campaign chairman, who for months stood resolute in his innocence and determined to fight charge upon charge even as fellow onetime loyalists caved, reached an extraordinary plea agreement with special counsel Robert Mueller’s office on Friday that requires him to assist the Russia investigation and converts him into a potentially vital government cooperator. The deal, struck in Washington just days before Manafort was to have faced a second trial, is tied to Ukrainian political consulting work and unrelated to the Trump campaign. The question remains what information Manafort, 69, is able to provide about the president, as well as whether the Trump election effort coordinated with Russia. Manafort’s leadership of the campaign at a time when prosecutors say Russian intelligence was working to sway the election, and his involvement in episodes under scrutiny, may make him an especially insightful witness. Manafort was among the participants in a June 2016 Trump Tower meeting in New York with Russians and Trump’s oldest son and son-in-law that was arranged for the campaign to receive derogatory information about Democratic president nominee Hillary Clinton. He was also a close business associate of a man who U.S. intelligence believes has ties to Russian intelligence. While he was working on the campaign, emails show Manafort discussed providing private briefings for a wealthy Russian businessman close to Vladimir Putin. Manafort had long resisted the idea of cooperating even as prosecutors stacked additional charges against him in Washington and Virginia. Trump had saluted that stance, publicly praising him and suggesting Manafort had been treated worse than gangster Al Capone. Trump’s lawyer, Rudy Giuliani, had suggested a pardon might be a possibility after the investigation was concluded. Manafort agreed to provide any information asked of him, testify whenever asked and even work undercover if necessary. The cooperation ensures the investigation will extend far beyond the November elections despite entreaties from the president’s lawyers that Mueller bring it to a close. The agreement makes Manafort the latest associate of Trump, a president known to place a premium on loyalty among subordinates, to admit guilt and work with investigators in hopes of leniency. Mueller had already secured cooperation from a former Trump national security adviser who lied to the FBI about discussing sanctions with a Russian ambassador; a Trump campaign aide who broached the idea of a meeting with Putin; and another aide who was indicted alongside Manafort but ultimately turned on him. Trump’s former personal lawyer has separately pleaded guilty in New York. Manafort was convicted last month of eight financial crimes in a separate trial in Virginia and faces an estimated seven to 10 years in prison in that case. 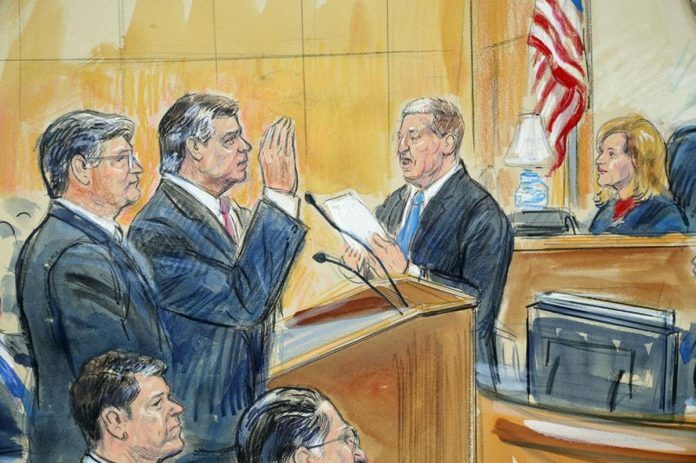 The two conspiracy counts he admitted to on Friday carry up to five years, though Manafort’s sentence will ultimately depend on his cooperation. “He wanted to make sure that his family was able to remain safe and live a good life. He’s accepted responsibility. This is for conduct that dates back many years and everybody should remember that,” Manafort attorney Kevin Downing said outside court. White House press secretary Sarah Sanders insisted the Manafort case was unrelated to Trump. Giuliani said he spoke to Trump on Friday about Manafort’s plea. It’s unclear how the deal might affect any Manafort pursuit of a pardon from Trump, though Giuliani told Politico before the deal that a plea without a cooperation agreement wouldn’t foreclose the possibility of a pardon. Under the terms of the deal, Manafort was allowed to plead guilty to just two counts, though the crimes he admitted largely overlap with the conduct alleged in an indictment last year. He abandoned his right to appeal his sentences in Washington and Virginia and agreed to forfeit homes in New York, including a condo in Trump Tower. But the guilty plea spares Manafort the cost of a weekslong trial that could have added years to the prison time he’s already facing following the Virginia guilty verdicts. A jury there found him guilty of filing false tax returns, failing to report foreign bank accounts and bank fraud. Jurors deadlocked on 10 other counts. Prosecutors on Friday presented new information about allegations they were prepared to reveal at trial, which was to have focused on Manafort’s political consulting and lobbying work on behalf of former Ukrainian President Viktor Yanukovych and the pro-Russian Party of Regions. That case alleged that Manafort directed a large-scale U.S. lobbying operation for Ukrainian interests but never registered with the Justice Department as a foreign agent despite being required to do so under the law, and that he concealed millions of dollars in income for the consulting work from the IRS. He also failed to disclose his involvement in lobbying efforts made through a group of former European politicians, known as the Hapsburg Group, who pushed policies beneficial to Ukraine, prosecutors said Friday. Another allegation revealed Friday concerns Manafort’s efforts to peddle stories to discredit Yanukovych’s opponent, Yulia Tymoshenko, and undermine U.S. government support for her. Prosecutors said he spread stories and secretly coordinated with an Israeli government official to publicize the idea that a U.S. Cabinet official was an anti-Semite for supporting Tymoshenko, “who in turn had formed a political alliance with a Ukraine party that espoused anti-Semitic views,” court documents said. “I have someone pushing it on the NY Post. Bada bing bada boom,” Manafort wrote to a colleague, prosecutors say.